I would like to show you my new shaving Scuttle. A beautiful piece of pottery. Enjoy. 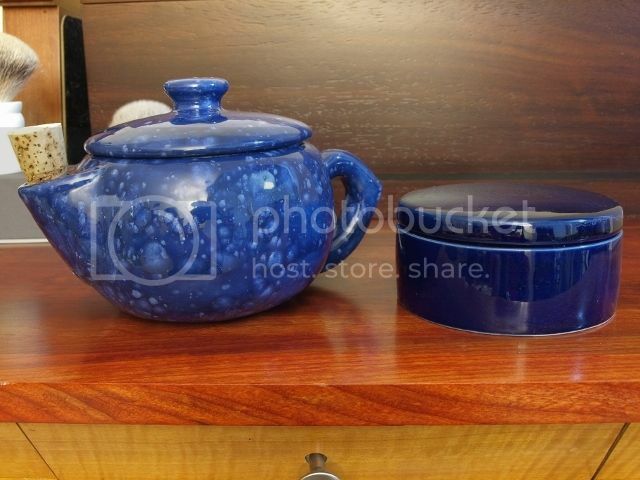 I have never seen a scuttle style like that, looks really great. That glaze is blinding, excellent. That's unique looking - in a good way. Is the spout for a brush? Amazing looking scuttle enjoy it! Interesting design, I like it. Nice score! That one is a beauty. I really like the large opening in the spout for dipping the brush. Who made it for you if you would be so kind. It looks like a Schwarzweisskeramik scuttle. Very manly and useful. Congrats on that! Nice scuttle, let us know how you like it. I forgot about this topic. I bought this Scuttle Here. And they even took my pictures. Yes, spout is for a brush. I am very pleased with this Scuttle. I have 3 more, but this is special because spout. Very practical. The right one is mine. Inside him I could put 2 liters of water. So Lather remains hot for a really long period. But is as huge as an elephant. Too heavy. Inside the left one i could put around 400 ml of water. My new to me Robert Becker scuttle. Perfect condition and great finish!